The Chair by James L Rubart is a contemporary Christian thriller. It is a most unusual novel but one that I thoroughly enjoyed. At times my heart was racing with the action. There are many themes in the novel but a major one is forgiveness. Sometimes we need to forgive others, sometimes we need to forgive ourselves and sometimes we need to ask for forgiveness. Living with guilt is tied in to the forgiveness theme. So is bitterness. The Chair shows how one event has the power to ruin lives if one lives with one eye on the past. Let go of the guilt. Let go of the bitterness. Receive forgiveness. Another major theme is that of seeking God. Seeking God is different to seeking religion. Within the novel James L Rubart shows how damaging religion can be. Tori’s parents took her to church growing up. She experienced religion and hypocrisy, and now grown up, she wants nothing to do with God or church. In contrast antique dealer Corin has not been to church but has spent his life trying to fill a hole with one big thrill after another. Corin searches for his next high, when he really needs God to fill the hole inside him. Will anyone show God to Corin? There is the theme of healing within The Chair. Corin is given an old chair supposedly made two thousand years ago by a carpenter from Nazareth. Miraculous tales are attached to the chair, including those of healing. How true is the legend? Do any characters experience any healing? Family feuds and broken relationships are prevalent within the novel. Past hurts must be faced if any future restoration is to occur. James L Rubart shows that even in Christians, battles against the flesh occur. Good intentions are often competing with weak wills. It is important to share one’s struggles and to find someone to whom you can be accountable and who will help. 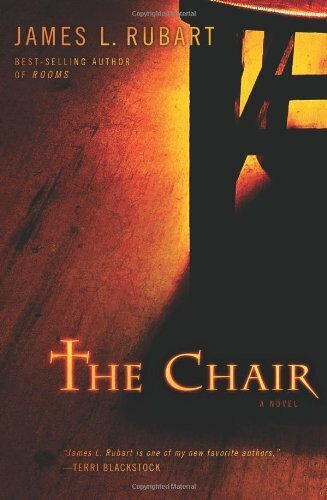 The Chair was a totally unique novel and a definite page turner. I shall be delving into more novels by James L Rubart. I’m getting it. Thanks for the recommendation and the review.